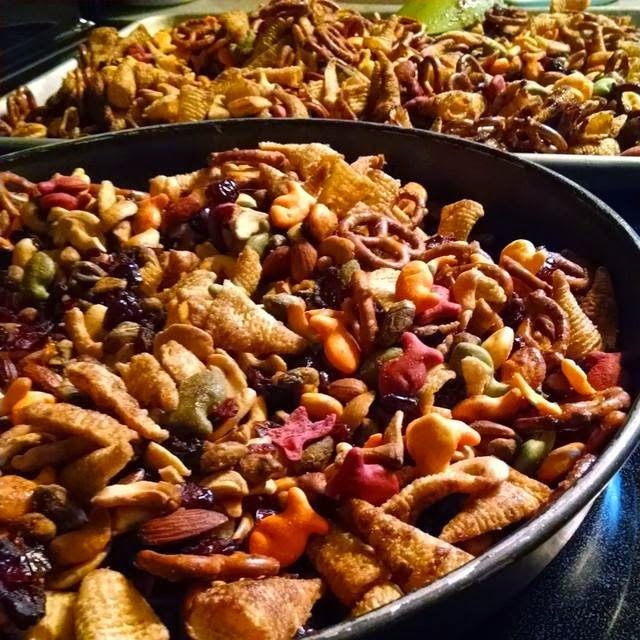 Looking for a tasty twist on the same old snack mix? I L-O-V-E the combination of spice (black pepper, jalapeno, chili peppers) and sweet (mango, honey, sugar) and was daydreaming about how I could somehow incorporate that into a snack mix with my favorite crackers, nuts, and other tasty nibbles. Combine all ingredients in large bowl then toss with seasoning mixture. Spread on jelly roll pan(s) and bake at 350 for 20 minutes stirring once or twice (a large plastic spoon works well). Remove from oven, place in air-tight container and toss in 2 cups craisins and 1 cup fish crackers. Let cool completely before sealing container. This recipe is EXTREMELY flexible. Once you taste the 'sauce' you may decide you want more cinnamon and less brown sugar. . . or less pepper and more maple syrup. Or maybe you like extra-seasoned snack mix and want to double it all - DO IT!!! This recipe is just a suggestion of what I found works for us. Feel free to add more or less of anything suggested. Trust me, this recipe is constantly being tweaked depending upon the occasion, ingredients on hand, and who's going to be munching it. Wallbanging Good Orange Cake. Seriously.